In addition to the diverse outdoor experiences, Jones Island Club features three large and comfortable lodges on the island, each containing eleven bedrooms, six bathrooms, a great room, dining area, bar area, and a commercial style kitchen. 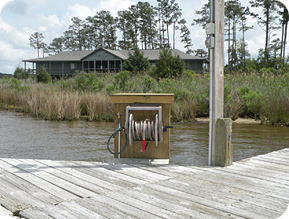 All facilities of Jones Island Club are open to members year round. While each lodge uniquely decorated, all lodges feature the same amenities. All lodges have a screened porch on each lodge offers beautiful waterfront views and is equipped with a Wilmington Grill. All kitchens have a fully stocked pantry where all meals are prepared by the club housemothers and cook staff. Lodges are cleaned each day by the club staff, including linen service for individual rooms. Heavy appetizers, bar setups, and an oyster roast are featured each night at the club before dinner. Additionally, all lodges have a ground level mudroom with individual member lockers to store hunting clothes, waders, and other outdoor gear. Jones Island Club is established in a condominium association, where the members own their individual rooms and have an equity interest in all of the common property, facilities, and equipment. In Fall 2011, Jones Island Club began its capital improvement project to update some of the clubs structures and amenities. This included all new docks, all new duck blinds, a new boat house, a new equipment shed and all new exterior lighting.